The posters were initially distributed last fall as part of the campaign launch to more than 10,000 high schools. Due to high demand, FDA, in conjunction with Scholastic, will now send posters to the more than 20,000 remaining public and private high schools in the United States. Schools do not need to request these posters; we’re proactively mailing them directly to schools. 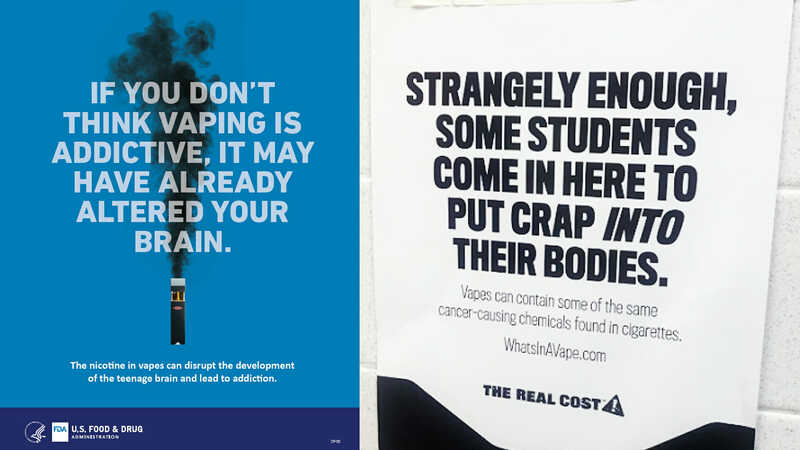 In addition to providing the “The Real Cost” campaign posters to high schools, FDA has developed two new posters for use by doctors, youth groups, churches, state and local public health agencies, and others who may find these resources helpful in educating youth on the dangers of e-cigarette use. The posters, which also address the potential health consequences of e-cigarette use, are available for download or for print via the CTP Exchange Lab. FDA Center for Tobacco Products – February 5, 2019. EcigN8 vape shop will give a $100 in store credit to the first Adult who can medically prove that they are “BRAIN DAMAGED” from doing Nicotine as a teen! EcicN8 Carrollton Vape Shop does not sell or market to teens or children – unlike the the naysayers who use vaping puppets, attractive young adults, and cotton candy in their propaganda campaigns! The chemical they mention in this ad campaign that “will cause cancer” is Acrolein – it is found in Vape… IF YOU BURN IT – it’s also found in CHICKEN if you Burn it! Kids are not stupid – and if you lie to them or give them false information, then they won’t listen to you – and will do it just to spite you! I wouldn’t mind these ad campaigns if they actually told the whole truth – like it’s an ADULT alternative to smoking that is proven to be 95% safer than cigarettes! Yes, there are studies that suggest that nicotine is dangerous for kids! But they never seem to mention that Vaping can be done with zero nicotine! And none of the dangers they mention are unique to Vaping. Kids – DON’T DO IT – it’s ILLEGAL to do in School! We all know the dangers of nicotine – how about we quit pretending that Vape (which is saving lives) is the enemy. Kids – it’s NOT FOR YOU! Quit trying to Demonize Vape – so that everyone can go back to smoking and Big Government, Big Tobacco and Big Pharmaceuticals can get back to their sick ménage à trois paid for by your tax dollars. Kids and Adults- Don’t Buy into BIG Public opinion. You are not a Puppet! Join us for this EXCLUSIVE SNIPPET from our interview with GrimmGreen—only on RegWatch by RegulatorWatch.com. RegulatorWatch.com - August 7, 2017. Vaping Coverage Get it NOW! Sign Up for Incisive Content! RegWatch original video is designed to move opinion. Get our videos first and be the first to share.